Blog » Christmas 2018 » 3 Great Reasons to Buy Casio this Christmas! Since 1946, Casio are one of the world’s leading electronic brands. And of course a huge part of that recognition comes from their musical instrument arm! Their digital pianos demonstrate a unique combination of digital innovation and acoustic tradition. And at the other end of the spectrum, their electronic keyboards are ideal for beginners with intuitive features and built-in tutorials. Casio bring 3 great offers this Christmas, meaning there’s no better time to get on board! 1. Silent Practice, Silent Night: Free Pair of Bose Headphones with Casio Grand Hybrid! 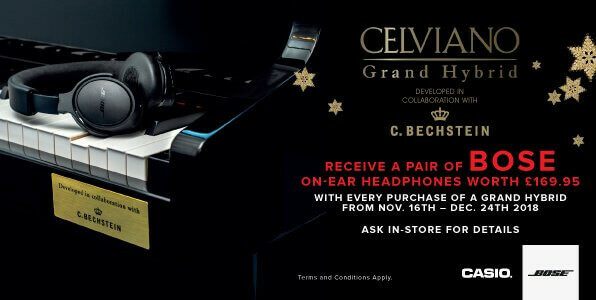 With every purchase of a Grand Hybrid Piano this Christmas you will receive a complementary pair of Bose on-ear headphones! These are worth £169.95, and will make late-night practice far more peaceful for the rest of your home. As long as you purchase a qualifying product, you’ll receive a pair of these fantastic headphones. Full terms and conditions are available at Casio’s website. 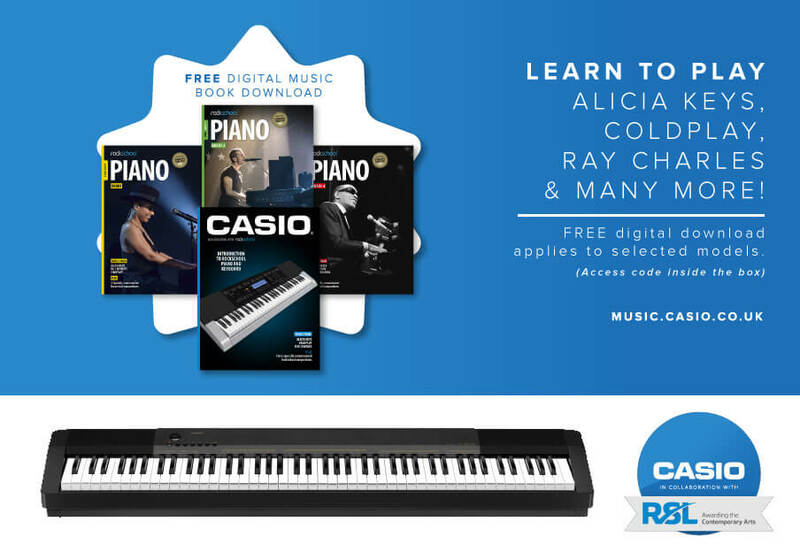 With the Casio CDP-130, PX-160 and all their Touch Sensitive Keyboard range you can download digital sheet music from Rockschool. Not only is the UK’s leading Rock and Pop examination board, but also lets you learn grades with tunes from Alicia Keys, Coldplay, Ray Charles and may more! Inside the box you’ll find your promotional code, and you’re away. Casio’s very own Music Academy provides high quality online video tuition across any Casio Digital Instrument! Get yourself online and learn to play the piano, a skill that will last a lifetime.